THIS. Is the true Kirby Wii we've been waiting for! And what an amazing game it is! 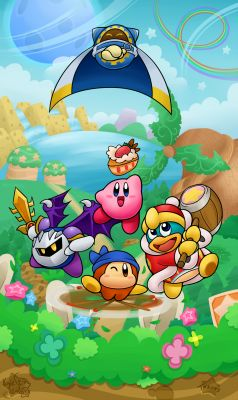 :D It's my favorite game in general to date, best Kirby game in my opinion, amazing gameplay, cute-as-ever characters, gorgeous visuals, a twisting plot, and a magnificent soundtrack! Everything about this game is just truly amazing! Oh I just simply adore this! And the video was just awesome! What program/thingy did you use to make this? And how did you record it? Lately I've been trying to document my art process too, but all I've got are photos of me doing it. Wow, this is 100% amazing, awesome and epic. Isee the process on youtube that you made to get this Masterpiece of Kirby. I like the way in how you draw each one of the four heroes that appear in this epic adventure and the perspective of Magolor is so good, too. It gives him a evil look. The background is amazing and so detailed. Excelent work Torkirby with another of your masterpieces. I hope see more of your work. I saw your video,its AMAZING! !I first saw it on deviantart!